Grandma, what Big Eyes you have! 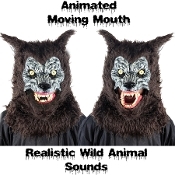 Stop your hunt, the BROWN WEREWOLF MOVING MOUTH MASK is all you need for a realistic wild animal inspired look. Legends come to life with this illusive brown were wolf animated mask with scary sound effects! See VIDEO below. The detailed monster were wolf face is gray with beady yellow eyes, snarling nose and growling mouth with sharp fangs! The mouth moves when you move your mouth, creating the illusion of a real wolf! Brown werewolf mask is made from molded plastic and covered in plush brown fur with eerie yellow eyes. Lightweight, comfortable and easy to wear, this realistic werewolf mask is made from molded plastic and covered in plush brown fur.